It’s not often that students are encouraged to drop their pencils, close up their laptops and walk out of class. 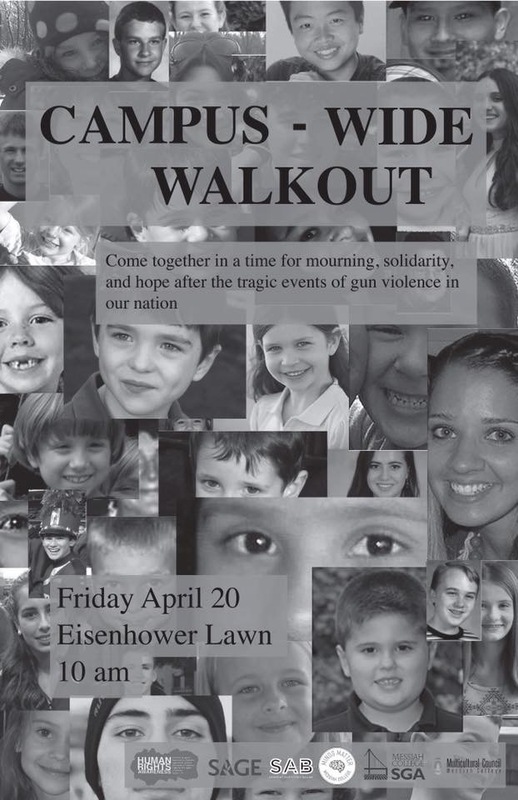 This Friday at 10 a.m. on Eisenhower Lawn there will be a campus-wide walkout to encourage solidarity in the wake of many shootings that have devastated the nation. A group of students, lead by Toby Doyle and Sam Rockhill, organized the event and have gained the support of executive clubs on campus such as SAB, SGA, Multicultural Council, Minds Matter and Human Rights Awareness. The timing of this walkout is very intentional as well. Friday is the anniversary of the Columbine shooting and 10 a.m. is when the shooting in Parkland happened. The campus-wide walkout is just one of many happening nationwide on Friday. Speakers at the walkout will include Jeanette Ames, Kim Phipps, Jamie-Claire Chau, Sarah Fe Harris, David and Brian Freda, Drew Hart, Kevin Villegas, Lynn Maynard, Doyle and Rockhill. Those involved in the planning remind students that the walkout is about unity, not politics. “We hope to demonstrate that this is not a politically affiliated event,” Doyle said. SGA clarified that professors and other staff were made aware of this event. Students are encouraged to speak to their professors if they have class during the time of the walkout, but excused absences are not guaranteed. Walking out of class does nothing for anyone. You should be IN class and thank God for your blessing of being able to afford such an expensive education when there are children all around the world who would be happy to take your seat.